Mesut Ozil says he prays and recites from the Quran before each match. 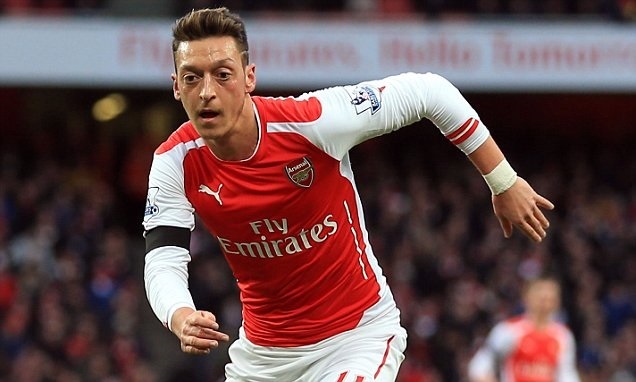 All things considered, 2014 was a smashing success for Mesut Ozil. While the 26-year-old midfielder’s injury-plagued first full season with Arsenal of England’s Premier League was just mediocre by his world-class standard — seven goals and 14 assists in 40 appearances — Ozil’s calendar year was defined by what he accomplished wearing his national team uniform. In July of 2014, Ozil helped Germany claim the FIFA World Cup title, registering a goal and an assist in seven matches while completing over 78 percent of his passes. After the tournament, Ozil made international headlines with a gesture of charity consistent with his values as a practicing Muslim: He donated his entire World Cup winnings to pay for the surgeries of 23 Brazilian children, his “personal thank you” to the tournament’s host nation. The new year brought a new-look Özil. He trotted on to the pitch with Arsenal in cruise control against Stoke, 3-0 up, and looked noticeably beefier. (Arsene) Wenger‘s praise for the endurance work that marked his three-month rehabilitation — “he pushed his body to the limit of what you can absorb physically,” said his manager — appeared well-founded. Could this bulked-up physique have a real impact on his game? A cameo at the end of a 3-0 home win that was fizzling out was not the ideal outing to judge but the question is a critical one in terms of perceptions of Özil the Arsenal player. After a curious 18 months in England, which has left a lot of observers gently pushing him towards the pigeon hole where expensive disappointments are filed, he remains an enigmatic talent. Reconciling the subtle touches and graceful movement with that nonchalant body language and indifference to tracking back makes it tricky to weigh up his contribution. He had a strange year in 2014. It was sweet and sour. The German schemer is entitled to use the medals on the table argument but 2014 was also a year in which Özil’s game, and whether he is yielding the best from his skillset, came under scrutiny. Arsenal have not yet seen Özil at his finest for a prolonged spell. He has decorated more games than he has designed but what now? Is he, as Wenger suggested last week, ready and hungry to become more fundamentally important to the way Arsenal play? Going into Arsenal’s Jan. 18 match against Manchester City, Ozil has one goal and two assists in eight appearances this season.